An in-depth report on the causes, diagnosis, treatment, and prevention of common nasal allergies. Nasal allergies can be associated with sinus inflammation and congestion; so the term 'allergic rhinosinusitis' is commonly used. Outdoor triggers of allergic rhinitis include pollens from ragweed, grass, trees, and mold spores. Outdoor allergens cause seasonal allergic rhinitis (also known as hay fever), which typically occurs during the spring to the early summer, and late summer to early fall. Indoor triggers include dust mites, pet dander, pest allergens (from rodents, cockroaches), or mold that grows in humid indoor places such as carpets. Indoor allergens can cause perennial (year-round) allergic rhinitis. Allergic rhinitis tends to run in families. If one or both parents have allergic rhinitis, there is a higher likelihood that their children will also have allergic rhinitis. People with allergic rhinitis have an increased risk of developing asthma and other allergies. They are also at risk for developing chronic sinusitis, sleep disorders (including snoring), and ear infections. 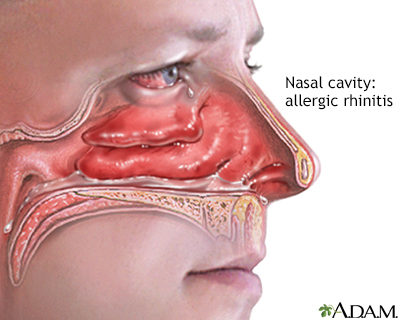 Home remedies for allergic rhinitis include nasal washes with saline solution. Many different over-the-counter and prescription drugs are used to treat allergic rhinitis. First-line medications include corticosteroid nasal sprays and oral antihistamines. Immunotherapy (allergy shots or under-the-tongue tablets) and medications like montelukast may also be options for some people. In addition to avoiding exposure to allergy triggers, people with allergic rhinitis can take precautions to control their environment. These measures include bathing pets weekly, using vacuum cleaners and air conditioners with high-efficiency particulate air (HEPA) filters, frequent washing of bedding and curtains, using dust mite-proof covers on their beds (especially if they are allergic to dust mites), reducing humidity in the house, and removing sources of mold. Acupuncture may be helpful for some people with allergic rhinitis, according to 2015 guidelines from the American Academy of Otolaryngology -- Head and Neck Surgery Foundation. Acupuncture would typically be used in addition to, rather than to replace, more conventional therapies noted above. Rhinitis is inflammation of the mucous membranes of the nasal and sinus passages. It can result in severe nasal and sinus congestion or other changes that irritate the nose. Allergic rhinitis is caused by a substance (allergen) that triggers an allergic response. As part of the allergic response, the body's immune system releases histamine and other chemicals. Such as pollen or mold spores are usually the cause of seasonal allergic rhinitis. Such as animal dander or dust mites are common triggers of perennial allergic rhinitis. Rhinitis can also be due to non-allergic causes, such as infections, temperature changes, hormonal changes, certain medications, cigarette smoke, stress, exercise, structural problems in the nose, or other factors. In non-allergic rhinitis, the immune system plays a different role in the body's response to these factors. , occurs when the body overreacts to a substance that it inappropriately senses as a foreign invader. The immune system works continuously to protect the body from potentially dangerous intruders such as bacteria, viruses, and toxins. However, for reasons not completely understood, some people are hypersensitive to substances that are typically harmless. When the immune system inaccurately identifies these substances (allergens) as harmful, an allergic reaction and inflammatory response occurs. When an allergen enters the body, the immune system produces immunoglobulin E (IgE) antibodies. These IgE antibodies then attach themselves primarily to mast cells, which are found in the nose/sinuses, eyes, lungs, and digestive tract. IgE can also attach to other cells of the immune system that contribute to allergy but are not as important 'first-line' responders as mast cells. The mast cells release inflammatory chemical mediators, such as histamine, that cause atopic symptoms (sneezing, coughing, and wheezing). The mast cells continue to produce more inflammatory chemicals that stimulate the production of more IgE antibodies and recruit other inflammatory cells (like eosinophils), continuing the allergic process. There are many types of IgE antibodies, and each is associated with a specific allergen. This is why some people are allergic to cat dander, while others are not bothered by cats yet are allergic to pollen. In allergic rhinitis, the allergic reaction begins when an allergen comes into contact with the mucous membranes that contain mast cells in the lining of the nose. Ragweed is a major cause of allergic rhinitis in the United States. Ragweed season generally lasts from mid-August through the first frost in temperate climates. One plant can release 1 billion pollen grains during the course of a season. Pollen counts are usually highest between 10 a.m. and 3 p.m.
Grass pollen, especially from ryegrass and other common so-called pasture grasses, is another common cause of allergic rhinitis. Grasses affect people from late spring to early summer. Grass pollen levels tend to be highest in the late afternoon. Small pollen grains from certain trees usually produce symptoms in the early spring. Mold grows on dead leaves and releases spores into the air. They peak in the spring in warmer climates and in the fall in cooler climates. In some warmer parts of the United States, they may be prevalent year-round, and as noted below can be triggers for perennial allergic rhinitis caused by indoor molds. House dust mites, specifically mite feces, are coated with enzymes that contain powerful allergens. Dust mites thrive in mattresses and upholstered furniture, especially in warmer, humid climates. Molds growing on wallpaper, house plants, carpeting, and upholstery. Allergic rhinitis usually first appears in childhood or early adulthood but it can affect people of all ages. Allergic rhinitis appears to have a genetic component. People with a parent who has allergic rhinitis have an increased risk of developing allergic rhinitis themselves. The risk increases significantly if both parents have allergic rhinitis. Home, workplace, or outdoor environments can increase the risk for exposure to allergens (mold spores, dust mites, animal dander, pollen) associated with allergic rhinitis. Seasonal allergic rhinitis that develops during childhood, on average, tends to diminish with age. In fact, many people who develop seasonal allergic rhinitis in early childhood tend not to have the allergy in adulthood. In some cases, allergies go into remission for years and then return later in life. People who develop allergies after age 20, however, tend to continue to have allergic rhinitis at least into middle age. Asthma and allergies often coexist. People with allergic rhinitis often have asthma or are at increased risk of developing it. Allergic rhinitis is also associated with eczema (atopic dermatitis), an allergic skin reaction characterized by itching, scaling, and red swollen skin in certain typical areas of the body. Chronic uncontrolled allergic rhinitis can worsen asthma attacks and eczema. People with allergic rhinitis, particularly those with perennial allergic rhinitis, may experience sleep-disordered breathing and daytime fatigue. Often they attribute this to allergy medication, but congestion may be the cause of these symptoms. People who have severe allergic rhinitis tend to have worse sleep problems, including snoring, than those with mild allergic rhinitis. Any chronic rhinitis, whether allergic or non-allergic, can cause swelling in the turbinates, which may become persistent (turbinate hypertrophy). The turbinates are tiny, shelf-like bony structures covered by a cell layer that lines the nasal passages that project into the nasal passageways. They help warm, humidify, and clean the air that passes over them. If turbinate hypertrophy develops, it causes persistent nasal congestion and, sometimes, pressure and headache in the middle of the face and forehead. If severe, this condition may require surgery. Although allergic rhinitis is not considered a serious condition, it can interfere with many important aspects of life. Nasal allergy sufferers often feel tired, miserable, or irritable. Chronic allergic or non-allergic rhinitis can interfere with work or school performance, as well as social functioning. Symptoms of allergic rhinitis often occur in two phases, early and late. Occurs less than 4 days a week and for less than 4 weeks per year. Occurs at least 4 days a week and for at least 4 weeks a year. Causes minimal symptoms that do not impact sleep and daily life. Has symptoms that cause enough discomfort to affect day-to-day, work, or school activities as well as to disrupt sleep. When your rhinitis occurs. Rhinitis that appears seasonally is typically due to pollens and outdoor allergens. If symptoms occur throughout the year, perennial allergic or non-allergic rhinitis may be the cause. Exposure to household or occupational allergens, including pets and pests. Exposure to strong odors or chemicals (e.g. certain household cleaning products). Personal history of asthma or other allergies. The provider may examine the inside of the nose with an instrument called a speculum. This is a painless procedure that allows the doctor to check for signs of inflammation and swelling on the turbinates and other areas of the nasal cavity. The provider will also check the eyes, ears, and chest. Allergy testing may be used to confirm an allergic trigger identified by symptoms. A skin prick test is a simple method for detecting sensitivity to common allergens. People are usually tested for a panel of common allergens. Skin tests are rarely needed to diagnose milder seasonal allergic symptoms before treatment is tried. Skin tests are not completely accurate as they do not always predict symptoms, and are not appropriate for children younger than age 3. Do not take short acting antihistamines (like diphenhydramine) for at least 48 to 72 hours before the test, or long acting antihistamines (like cetirizine, loratadine, fexofenadine) for 10 days before the test, otherwise an allergic reaction may not show up. Small amounts of suspected allergens are applied to the skin with a needle prick or scratch or are injected a few cells deep into the skin. The injection test may be more sensitive than the standard prick test. If an allergy is present, a hive (a swollen reddened area that may be itchy) forms within about 15 minutes. Blood tests for immunoglobulin (IgE) production may be performed. Like skin tests, IgE blood tests detect increased levels of allergen-specific IgE in response to particular allergens. However, blood tests for IgE do not always correlate/agree with skin prick tests. The health care provider may take a nasal smear. The nasal secretion is examined under a microscope for increased white blood cell counts (indicating infection), or high eosinophil counts (indicating an allergic condition, but low counts do not rule out allergic rhinitis). In some cases of chronic or unresponsive seasonal rhinitis, a provider may use endoscopy to look for irregularities in the nose structure. Endoscopy inserts a tube containing a miniature camera through the nose to view the passageways and further back at the openings of the sinuses. Rhinitis always precedes and accompanies sinusitis, which is inflammation or infection of the mucous lining of the sinuses. Acute sinusitis usually clears up on its own. Chronic sinusitis can be more difficult to treat. Allergic rhinitis symptoms begin soon after exposure to an allergen. Colds or flu develop several days after exposure to a virus. Allergic rhinitis symptoms last as long as you are exposed to the allergen. Cold and flu symptoms generally last 3 to 14 days. The nasal discharge in allergic rhinitis is usually clear. In colds or flu it is more likely to be discolored (yellow). Colds and flu are often accompanied by aches and pain, and a general sensation of "being sick". A fever is a definite sign that the condition is a cold or flu and not allergic rhinitis. Environmental control measures can help reduce exposure to allergens. Nasal washes may provide symptom relief. Oral medications including antihistamines (both prescription and over-the-counter), decongestants, leukotriene antagonists. Immunotherapy (allergy shots or under-the-tongue tablets) is an option for people with severe allergies. Acupuncture may be helpful for some people. Surgery is rarely needed for allergic rhinitis. A procedure called inferior turbinate reduction may be recommended for people who have nasal obstruction and enlarged turbinates (structures within the nose). Surgery may be necessary to treat non-allergic rhinitis. For both adults and children who have allergic rhinitis and asthma, treatment of rhinitis may help control asthma symptoms. May require only reducing exposure to allergens and using a nasal saline wash. You can buy a saline solution at a drug store or make one at home using 1 cup (250 mL) of warm water, half a teaspoon of table, Kosher or sea salt, and pinch of baking soda. If you prepare your own saline solution, use distilled or boiled water, not plain tap water, to avoid potential infection with a dangerous type of water-dwelling parasite called Naegleria fowleri. Many individuals with mild allergic rhinitis will also use a longer acting, non-sedating antihistamine (e.g. cetirizine, loratadine, fexofenadine) on an as needed basis. May require a prescription drug in addition to environmental control measures. Intranasal steroids or oral antihistamines are generally the first choices and are available over the counter. Intranasal steroids are a more effective treatment since they help relieve congestion as well as sneezing, runny nose, and itchy eyes. Antihistamines alone are not effective for treating nasal and/or sinus congestion. If your allergic rhinitis does not improve, other types of drugs may be tried or added. Immunotherapy (allergy shots or sublingual tablets) are another option. Antihistamine and steroid drugs treat nasal symptoms but they can also help itchy, watery, and red eyes. OTC eye drops can also provide relief, but should not be used for prolonged periods of time. If your eye allergy symptoms continue to bother you, discuss with your provider other types of prescription eye drops. help reduce the inflammatory response associated with allergic reactions. They can help improve both nasal and eye symptoms. Nasal-spray corticosteroids are considered the most effective drugs for controlling the symptoms of moderate-to-severe allergic rhinitis. May be used alone or in combination with a nasal antihistamine or nasal decongestant. (A nasal spray decongestant should be used only for 3 days or less.) As a rule, it takes 1 to 2 weeks before seeing symptomatic improvement from nasal steroids, and as much as 4 weeks for maximal improvement. It is therefore important that these medications be taken regularly as directed to get the most benefit. Nasal steroids are considered 'controller' medications and do not provide quick relief, so it is very important not to 'give up' and stop after a week, for example, as it takes longer to notice benefit. These nasal sprays are approved for children. Ages vary depending on brand. While effective for treating symptoms of allergic rhinitis, oral steroids can have many systemic side effects, most often when used repeatedly or for a long time, including stunting growth in children and increasing risk for glaucoma. Nasal spray steroids do not appear to carry these risks. Still, discuss with your provider any possible risks and whether these drugs are appropriate for you. Histamine is one of the chemicals released when antibodies overreact to allergens. It is the cause of many symptoms of allergic rhinitis. Antihistamine drugs block the effects of histamine. These drugs can help prevent and relieve nasal, eye, and itching symptoms associated with allergic rhinitis. As noted earlier, they are not effective for treating nasal and/or sinus congestion. Antihistamine drugs are available in oral tablet and nasal spray forms, and also as eyedrops and a liquid preparation. Some antihistamines need a prescription while others are available over the counter. Some oral antihistamines come in combination with a decongestant. Antihistamines are generally categorized as first- or second-generation. Which include diphenhydramine (Benadryl, generic) and clemastine (Tavist, generic) cause more side effects (such as drowsiness) than most second-generation antihistamines. For this reason, as well as the fact that they are longer acting, second-generation antihistamines are generally preferred and recommended, especially for people whose main symptoms are sneezing and itching. Are sometimes referred to collectively as nonsedating antihistamines. However, cetirizine (Zyrtec, generic) and the nasal spray antihistamines (Astelin, Patanase) may cause drowsiness when taken at recommended doses. Loratadine (Claritin, generic) and desloratadine (Clarinex) can cause drowsiness when taken at doses exceeding the recommended dose. Loratadine is available over the counter and is approved for children age 2 and older. Loratadine-D (Claritin-D) combines the antihistamine with the decongestant pseudoephedrine. Desloratadine (Clarinex) is similar to Claritin, but is stronger and longer-lasting. It is available only by prescription. Cetirizine is approved for both indoor and outdoor allergies. It is the only antihistamine to date approved for infants as young as 6 months. It is available over the counter. Cetirizine-D (Zyrtec-D) is a pill that combines the antihistamine with the decongestant pseudoephedrine. is also available over the counter. A prescription medication approved to treat seasonal allergic rhinitis in patients age 2 and older. It is available in both pill and liquid form. A pill that combines an antihistamine and decongestant. Available as a liquid for people age 2 and older. Headache, dry mouth, and dry nose. These are often only temporary and go away during treatment. Drowsiness. The nasal spray forms may cause more drowsiness than the pill forms. Extended-release forms of loratadine and cetirizine have additional ingredients that can cause other symptoms, including nervousness, restlessness, and insomnia. Antihistamines may thicken mucus secretions and can worsen bacterial rhinitis or sinusitis. Antihistamines can lose their effectiveness over time and you may need to try a different one. Decongestants work by shrinking blood vessels in the nose. Many over-the-counter decongestants are available, which can be either taken by mouth or applied to the nose. Nasal-delivery decongestants are applied directly into the nasal passages with a spray, gel, drops, or vapors. Nasal decongestants come in long-acting or short-acting forms. The effects of short-acting decongestants last about 4 hours. Long-acting decongestants last 6 to 12 hours. The active ingredients in nasal decongestants include oxymetazoline, xylometazoline, and phenylephrine. Nasal forms work faster than oral decongestants. They also do not cause the drowsiness that can occur with decongestants that are combined with an antihistamine (e.g. Claritin-D). However, they can cause dependency and rebound congestion. The decongestant loses effectiveness and can cause increased congestion. The 12-hour brands pose a particular risk for this effect. The medical term for this is rhinitis medicamentosa (RM). When using a nasal spray, spray each nostril once. Wait a minute to allow absorption into the mucosal tissues, and then spray again. Do not share droppers and inhalers with other people. Discard sprayers, inhalers, or other decongestant delivery devices when the medication is no longer needed. Over time, these devices can become reservoirs for bacteria. Discard the medicine if it becomes cloudy or unclear. DO NOT USE NASAL DECONGESTANTS FOR LONGER THAN 3 DAYS. Oral decongestants also come in many brands, which have similar ingredients. The most common active ingredients are pseudoephedrine (Sudafed, other brands, generic) and phenylephrine, sometimes in combination with an antihistamine. Oral decongestants can cause side effects such as insomnia, irritability, nervousness, and heart palpitations. Taking pseudoephedrine in the morning, as opposed to later in the day or before bedtime, can help people avoid these side effects. Although much less common than with nasal decongestants, some individuals, with frequent and/or prolonged use, can develop RM from oral decongestants. Decongestants should not be used in children or infants under the age of 4 years. Some health care providers recommend not giving decongestants to children under the age of 14. Children are at particular risk for central nervous system side effects including convulsions, rapid heart rates, loss of consciousness, and death. Standard oral decongestants pose serious risks for people with high blood pressure. Your provider may recommend you take an alternative type of decongestant or avoid them all together. If you are pregnant or have any type of medical condition that affects your blood or circulation, discuss with your provider whether decongestants are safe for you. Oral decongestants can cause dangerous interactions when combined with certain types of medications, such as the antidepressant MAO inhibitors. They can also cause serious problems when combined with methamphetamines or diet pills. Be sure to tell your provider about any drug or herbal remedy you are taking. Caffeine can also increase the stimulant side effects of pseudoephedrine. Leukotriene antagonists are oral drugs that block leukotrienes, powerful immune system factors that cause airway constriction and mucus production in allergy-related asthma. They also mediate some of the typical symptoms of allergic rhinitis. Although formally FDA approved to treat allergic rhinitis, they are not a first-line treatment for allergic rhinitis. Leukotriene antagonists are sometimes used in combination with a nasal spray steroid or oral antihistamine. Leukotriene antagonists include zafirlukast (Accolate) and montelukast (Singulair). These drugs are mainly used to treat asthma. Montelukast is also approved to treat seasonal allergies and indoor allergies. The FDA warns that these drugs have been associated with behavior and mood changes, including agitation, aggression, anxiousness, dream abnormalities, hallucinations, depression, insomnia, irritability, restlessness, tremor, and suicidal thinking and behavior. People who take a leukotriene antagonist drug such as montelukast should be monitored for signs of behavioral and mood changes, especially after starting the medication. If you exhibit any symptoms, your provider should consider discontinuing the drug. Ipratropium bromide (Atrovent HFA) is a prescription nasal spray that can help relieve runny nose. It works best when given in combination with a nasal corticosteroid. Side effects include nasal dryness, nosebleeds, and sore throat. It should not be used by people who have glaucoma or men who have an enlarged prostate gland. Cromolyn sodium is both an anti-inflammatory drug and a specific blocker for allergens. The standard prescription cromolyn nasal spray (NasalCrom) is not as effective as steroid nasal sprays, and does not work in all people with allergic rhinitis. However, cromolyn-based medications have been available for decades and have an excellent safety profile with minimal side effects. Like nasal steroids, it may take several weeks to experience symptom relief. Immunotherapy is based on the premise that people who receive injections of a specific allergen will lose sensitivity to that allergen. Immunotherapy is given either as subcutaneous (under the skin) injections or as sublingual (under the tongue) tablets. Reducing sensitivity in airways in the lungs, as well as in the upper airways. Reducing asthma symptoms and the use of asthma medications in people with known allergies. Research suggests it may also help prevent the development of asthma in children with allergies. Immunotherapy may be given to anyone with allergies who does not get better with medication and who has had a positive allergy skin test to specific allergens. Immunotherapy should not be based on blood tests alone (presence of allergen-specific IgE antibodies). The latest guidelines indicate that immunotherapy injections are safe for young children. Some, but not all, sublingual tablets are approved for children. Immunotherapy is safe for pregnant women who are already receiving it, although doses are not increased. Immunotherapy should not be started during pregnancy. Everyone's health status should be determined before starting treatment. Injections of diluted extracts of the allergen are given on a regular schedule, usually once or twice a week, with gradually increasing doses until a maintenance dose has been reached. It usually takes 3 to 6 months to reach the maintenance dose. At that time, intervals between shots can be 2 to 4 weeks, and the treatment is continued for another 3 to 5 years. People usually experience some relief within 3 to 6 months. However, it may take a year after reaching the maintenance dose to exhibit signs of improvement. into the skin of the arm. may be an alternative option. Rush immunotherapy uses several shots a day over a period of 3 to 5 days to achieve the full dose. Studies suggest that it is effective and safe, but anaphylaxis and severe reactions can occur. It is only appropriate for some people and they must be monitored closely during this period for severe reactions. Sublingual immunotherapy (SLIT) is an oral form of immunotherapy that uses a fast-dissolving under-the-tongue tablet. Grastek (Timothy grass pollen extract) for treatment of this common grass pollen allergy, is approved for people ages 5 to 65. Oralair (Kentucky Blue Grass, Orchard, Perennial Rye, Sweet Vernal, and Timothy extracts) for the treatment of mixed grass allergies, is approved for people ages 10 to 65. Ragwitek (Short ragweed pollen extract) for the treatment of ragweed allergies, is approved for people ages 18 to 65. In 2017, the FDA approved the new sublingual immunotherapy drug Odactra, containing house dust mite allergens. Odactra is used for treatment of allergic rhinitis in people ages 18 to 65 with confirmed allergy to the dust mite species Dermatophagoides farinae and Dermatophagoides pteronyssinus. A sublingual tablet is taken once daily. Treatment typically starts 3 to 4 months before pollen season begins and continues thereafter. Unlike injection immunotherapy, there is no gradual dose buildup in sublingual immunotherapy; there is a single dose preparation that is taken daily at home after the first dose is given in an observed setting. If complications or allergic reactions develop, they usually occur within 30 minutes, although some can develop up to 2 hours after the shot is given. Minor side effects may include swelling and soreness at the injection site, which can warrant adjustments to the dosing schedule. More severe allergic reactions can also occur including anaphylaxis which can require urgent medical treatment. Injection immunotherapy should NOT be administered outside of a physician's office or medical setting. Sublingual tablets may cause throat irritation and itching in the mouth or ears. The first dose is given at a health care provider's office to make sure an allergic reaction does not occur. Subsequent doses are taken at home. Severe reactions are extremely rare with SLIT. People with severe or uncontrolled asthma should not use this treatment. Pollen. This is the primary cause of allergic rhinitis. Dust mites, specifically mite feces, which are coated with enzymes that contain a powerful allergens. Apart from high altitudes or very dry climates, dust mites are ubiquitous inside homes. Animal dander (flakes of skin) and hair from cats, house mice, and dogs. House mice are a significant source of allergens, particularly in urban children. Molds. Indoor dampness and mold odor are major triggers. Cockroaches are an important trigger of allergic rhinitis and asthma, and may reduce lung function even in people without a history of asthma. Stuffed toys should be kept out of the bedroom. Some studies suggest that early exposure to some of these allergens, including dust mites and pets, may actually prevent allergies from developing in children. People who already have pets and are not allergic to them are probably at low risk for developing such allergies later on. When children are exposed to more than one dog or cat during their first year, they have a much lower risk for not only pet allergies, but also seasonal allergies and asthma. (Pet exposure does not protect them from other allergens, notably dust mites and cockroaches). If possible, pets should be given away or kept outside. If this is not possible, they should at least be confined to carpet-free areas outside the bedroom. Cats harbor significant allergens, which can even be carried on clothing. Dogs usually present fewer problems. Washing animals once a week can reduce allergens. Dry shampoos that remove allergens from skin and fur and are available for both cats and dogs and are easier to use than wet shampoos. It is extremely difficult to effectively control pet allergens in the home even if the pet(s) are restricted to certain areas or rooms. For example, someone sits on the couch in the living room, then goes into the bedroom at bedtime. Even though the pet is excluded from the bedroom, you have essentially 'brought the pet into the bedroom' from an allergen standpoint. Although cigarette smoke is not a trigger for allergic rhinitis, parents who smoke should quit. Cigarette smoking can worsen non-allergic rhinitis and increases the risk of developing sinusitis.Studies show that exposure to secondhand smoke in the home increases the risk for asthma and asthma-related emergency room visits in children. Spray furniture polish is very effective for reducing both dust and allergens. Air purifiers and vacuum cleaners with High Efficiency Particulate Air (HEPA) filters can help remove particles and small allergens found indoors. Neither vacuuming nor the use of anti-mite carpet shampoo is effective in removing mites in house dust. Vacuuming actually stirs up both mites and cat allergens. People with these types of allergies should avoid having carpets or rugs in their bedrooms. For children with allergies, vacuuming should be performed when the child is not around. Encase mattresses and pillows in special dust-mite-proof covers (however, washing is still very important, because impermeable covers alone do not prevent allergies and studies have not proven a benefit with these covers). Wash pillows in water hotter than 130°F (54.4°C), or in warm water with detergent and bleach. Keep stuffed toys away from the bed and wash them weekly as described above. Placing toys in a dryer or freezer may help, but is not considered enough protection against dust mites. Have children sleep as high off the floor as possible (avoid the bottom bunk of a bunk bed). Keep humidity levels at no more than 30% to 50%. Dehumidify basements. Empty and clean the dehumidifier daily with a vinegar solution. Regularly clean any moldy surfaces in the basement or other areas of the home. Start taking allergy medications (intranasal steroids) 1 to 2 weeks before pollen season begins. Take allergy medications before going outside. If regular medications do not work, ask your provider about immunotherapy, such as allergy shots or under-the-tongue pills. These therapies may need to be started several months before pollen season begins. Do not schedule camping and hiking trips during times when the pollen count is high (In temperate climates: late March until mid-May for tree pollens, May and June for grass pollen and September to October for ragweed pollen). Wear sunglasses to prevent pollen from getting into the eyes. After being outdoors, clean off pollen residue by bathing, washing hair and clothes, and using a nasal salt water rinse. Keep doors and windows closed during pollen season. Air conditioners filter air as well as dehumidify. Filters need to be washed/changed regularly, especially during the pollen season. For mild allergic rhinitis, a nasal wash can help remove mucus from the nose. You can purchase a saline solution at a drug store or make one at home by mixing 2 cups (500 mL) of warm water (distilled or boiled), a teaspoon salt, and a pinch of baking soda. Some evidence suggests that people with allergic rhinitis and asthma may benefit from a diet rich in omega-3 fatty acids (found in fish, almonds, walnuts, pumpkin, and flax seeds) and fruits and vegetables (at least 5 servings a day). Researchers are also studying probiotics, good bacteria such as lactobacillus and bifidobacterium, which can be obtained in supplements. However, clear evidence that probiotics improved symptoms of allergic rhinitis is lacking. Some people with allergies report symptom relief through modalities such as acupuncture and Chinese herbal medicine. Recent guidelines suggest that acupuncture may indeed be helpful for people with perennial allergic rhinitis, and possibly seasonal rhinitis too. The evidence is inconclusive as to the benefits of Chinese herbal medicine. Bergmann KC, Demoly P, Worm M, et al. Efficacy and safety of sublingual tablets of house dust mite allergen extracts in adults with allergic rhinitis. J Allergy Clin Immunol. 2014;133(6):1608.e6-1614.e6. PMID: 24388010 www.ncbi.nlm.nih.gov/pubmed/24388010. Brinkhaus B, Ortiz M, Witt CM, et al. Acupuncture in patients with seasonal allergic rhinitis: a randomized trial. Ann Intern Med. 2013;158(4):225-234. PMID: 23420231 www.ncbi.nlm.nih.gov/pubmed/23420231. Cox L, Nelson H, Lockey R, et al. Allergen immunotherapy: a practice parameter third update. J Allergy Clin Immunol. 2011;127(1 Suppl):S1-S55. PMID: 21122901 www.ncbi.nlm.nih.gov/pubmed/21122901. Di Bona D, Plaia A, Leto-Barone MS, La Piana S, Di Lorenzo G. Efficacy of subcutaneous and sublingual immunotherapy with grass allergens for seasonal allergic rhinitis: a meta-analysis-based comparison. J Allergy Clin Immunol. 2012;130(5):1097.e2-1107.e2. PMID: 23021885 www.ncbi.nlm.nih.gov/pubmed/23021885. Dretzke J, Meadows A, Novielli N, Huissoon A, Fry-Smith A, Meads C. Subcutaneous and sublingual immunotherapy for seasonal allergic rhinitis: a systematic review and indirect comparison. J Allergy Clin Immunol. 2013;131(5):1361-1366. PMID: 23557834 www.ncbi.nlm.nih.gov/pubmed/23557834. Durham SR, Penagos M. Sublingual or subcutaneous immunotherapy for allergic rhinitis? J Allergy Clin Immunol. 2016;137(2):339.e10-349.e10. PMID: 26853126 www.ncbi.nlm.nih.gov/pubmed/26853126. Greiner AN, Hellings PW, Rotiroti G, Scadding GK. Allergic rhinitis. Lancet. 2011;378(9809):2112-2122. PMID: 21783242 www.ncbi.nlm.nih.gov/pubmed/21783242. Jaakkola MS, Quansah R, Hugg TT, Heikkinen SA, Jaakkola JJ. Association of indoor dampness and molds with rhinitis risk: a systematic review and meta-analysis. J Allergy Clin Immunol. 2013;132(5):1099.e18-1110.e18. PMID: 24028857 www.ncbi.nlm.nih.gov/pubmed/24028857. Juel-Berg N, Darling P, Bolvig J, et al. Intranasal corticosteroids compared with oral antihistamines in allergic rhinitis: A systematic review and meta-analysis. Am J Rhinol Allergy. 2017;31(1):19-28. PMID: 28234147 www.ncbi.nlm.nih.gov/pubmed/28234147. Lin SY, Erekosima N, Kim JM, et al. Sublingual immunotherapy for the treatment of allergic rhinoconjunctivitis and asthma: a systematic review. JAMA. 2013;309(12):1278-1288. PMID: 23532243 www.ncbi.nlm.nih.gov/pubmed/23532243. Matricardi PM, Kuna P, Panetta V, Wahn U, Narkus A. Subcutaneous immunotherapy and pharmacotherapy in seasonal allergic rhinitis: a comparison based on meta-analyses. J Allergy Clin Immunol. 2011;128(4):791.e6-799.e6. PMID: 21620452 www.ncbi.nlm.nih.gov/pubmed/21620452. Peng Y, Li A, Yu L, Qin G. The role of probiotics in prevention and treatment for patients with allergic rhinitis: A systematic review. Am J Rhinol Allergy. 2015;29(4):292-298. PMID:26163249 www.ncbi.nlm.nih.gov/pubmed/26163249. Scadding GW, Calderon MA, Shamji MH, et al. Effect of 2 years of treatment with sublingual grass pollen immunotherapy on nasal response to allergen challenge at 3 years among patients with moderate to severe seasonal allergic rhinitis: the grass randomized clinical trial. JAMA. 2017;317(6):615-625. PMID: 28196255 www.ncbi.nlm.nih.gov/pubmed/28196255. Sicherer SH, Wood RA; American Academy of Pediatrics Section On Allergy And Immunology. Allergy testing in childhood: using allergen-specific IgE tests. Pediatrics. 2012;129(1):193-197. PMID: 22201146 www.ncbi.nlm.nih.gov/pubmed/22201146. Xue CC, Zhang AL, Zhang CS, DaCosta C, Story DF, Thien FC. Acupuncture for seasonal allergic rhinitis: a randomized controlled trial. Ann Allergy Asthma Immunol. 2015;115(4):317.e1-324.e1. PMID: 26073163 www.ncbi.nlm.nih.gov/pubmed/26073163. Reviewed By: Frederic F. Little, MD, Department of Allergy and Pulmonary/Critical Care Medicine, Boston University School of Medicine, Boston, MA. Review provided by VeriMed Healthcare Network. Also reviewed by David Zieve, MD, MHA, Medical Director, Brenda Conaway, Editorial Director, and the A.D.A.M. Editorial team.